Well I didn’t find anything too interesting at the swap meet. I found several Sigma Six Joes, but I don’t have any and don’t want to start buying any. The only Joe item I found was a 1989 Heat Viper with a broken right hand. I picked him up for 50 cents. 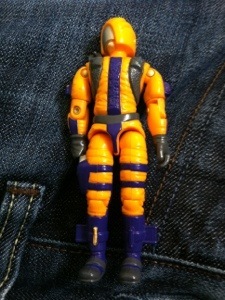 Categories: General Joe Stuff | Tags: GI Joe, Swap Meet | Permalink. So I am off to a local swap meet to see what gems I can find. I post up anything I grab later. In addition, I’m finally going to start going through some of the 30 boxes that this collection came in. I’ll also post pictures of those items as well. Categories: General Joe Stuff, New Joes | Tags: GI Joe, Giant Collection, New Joes, Swap Meet | Permalink.